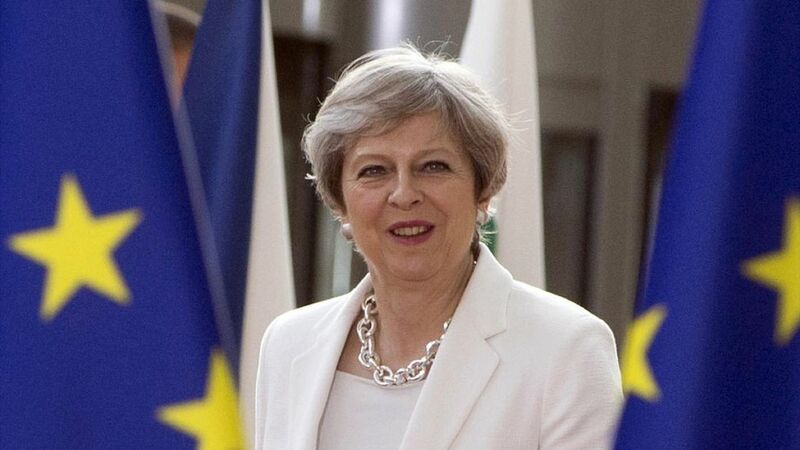 U.K. Prime Minister Theresa May offered European Union leaders a proposal during a summit in Brussels last night to allow E.U. citizens the right to stay in the U.K. after Brexit — a key point of contention in Brexit negotiations. The 3 million E.U. citizens currently living in the U.K. would not be forced to leave when Brexit occurs in March 2019, and those who had spent five years in the U.K. would be given "settled status," allowing them the same rights as U.K. citizens. Her proposal is contingent on getting a similar deal for the 1 million Brits currently living in the other 27 E.U. member states. Why it matters: The U.K.'s membership in the EU has been key to its economic vibrancy, making it Europe's financial center. May's offer could help retain its stature by reassuring EU citizens that they can remain in the country. While May had pushed for a "hard" Brexit over the past few months, this proposal shows a softening of her position after the shock election result earlier this month when her Conservative Party lost its majority in the House of Commons. This is not a concession she'd make to the E.U. if she'd been granted the mandate she'd expected. European leaders seemed to view the proposal as a step in the right direction for Brexit talks — German Chancellor Angela Merkel called it "a good start." And while some, like European Council President Donald Tusk, expressed hope that May's electoral setback could cause the U.K. to rethink Brexit entirely, it's more likely to expect negotiations to progress toward a "soft" Brexit given the instability of May's government. It wouldn't be politics if the knives weren't out for May at home. Former Chancellor George Osborne — David Cameron's #2, now the editor of the London Evening Standard —dropped a juicy editorial today pushing to allow E.U. citizens to stay in the U.K., which revealed that Cameron wanted to unilaterally reassure E.U. citizens of that in the days immediately following last year's Brexit vote. His entire Cabinet agreed, except then-Home Secretary Theresa May.